Disclaimer – This is a sponsored post brought to you by Joann. All opinions are 100% my own. Our theme this year for Christmas decor – at least the mantle and Christmas tree – is Home for the Holidays! It is so fun to pick a theme and in the past we have done everything from Dr. Seuss to Blue & Orange Alphabet to Woodland Wonderland. My mom teases me that I used to complain that she switched up her theme every year but I guess the apple doesn’t fall far from the tree…the Christmas tree 🙂 The theme this year is one that we showed off on our mantle and it really sets the tone for the tree too! I love when our mantle and tree are partners in themed crime! Here is what Home for the Holidays looks like near the fireplace…. Love that wintery garland and mixing that with red and white and metal finishes! The homes are both literal (those are actual light up houses) and figurative…nothing invokes a more homey holiday feel of warmth and relaxation than a traditional color scheme. So we definitely wanted to transfer that same feel to the christmas tree. Last year we set up our 12 foot tree(VIDEO HERE) in our living room and it was a BEAST. After decorating it, I felt like it took WAY too long (considering we have so many small children….anything that takes longer than a Paw Patrol episode is too long.) so this year I convinced Jeremy to set it up without some of the middle sections. This made it ten feet and it feels way more manageable if I can do the majority of it with only a step stool. Then we headed to JOANN to get our Home for the Holidays decorations! I am so excited to partner with them on our tree because I’m OBSESSED with their ornaments. This year I wanted to avoid traditional christmas ornaments (the ones that are balls) because well, frankly, I am always nursing Ella and Max’s two year old hands can NOT resist them. He must touch. He wants to throw. And because I know I can’t be consistent enough to get up and touch his hand every time he reaches for an ornament, I simply decided to just eliminate them completely. This allows me to be a better mom (I hate yelling across a room repeatedly because it literally slaughters the Christmas spirit) and keeps his toes safe from sharp glass Christmas shrapnel. All the boys were so excited to see the ornaments that we looked at every.single.one. This aisle endcap had personalized ornaments and William was the only one that could find his name! Max immediately liked the Santa ornaments in the fun youthful collection. And then when we got to the figurine ornaments, the boys were OVER THE MOON. All the boys were so excited to recognize their favorite things. The little old ladies in the aisle next to us laughed about the shrieks over FOOTBALL! GI-WAFFE! A HAMBOOGER! We did encourage them to pick something that they really loved….and steered them AWAY from the breakable ones. LJ got my favorite – the metal robot. Of course it is in his signature color 🙂 And Weston was adamant about getting the airplane. He said that now he can fly to Texas. We have no idea why he said that. Ha! Will picked an angel ornament because he said that he wanted to have something that reminded him of Jesus. And Max wanted the donut….until he realized that we said DO-NOT lick or bite it….then he promptly went back to the Santa ornament. After each kiddo had made their decisions, I decided that I need a few more homes for our tree – and headed back to the birdhouse section of the store to snag five….one for each kid! I love that they can reuse these later for their own little boyish plans! After picking up some more tree decorations, I went to check out with a big bundle. Thankfully JOANN always has amazing coupons so I saved more than half on everything! Once I got home, it was straight to work. A tree definitely has a certain order in which you do things…. Since the tree was already lit and I had laid the tree skirt, I moved right onto the ribbon. I had three different ones – a red plaid, a gold mesh style and a red and white striped one. I did it a little different this year….the gold went around the tree and the red ones came vertically from the top. Ribbon can be tucked into the tree now and tweaked later. It just gives you a good framework for when it comes to filling the rest of the tree up. Next came the garland. It was the same garland that I used on the mantle and I just tucked it horizontally around the tree at 2′ spacing. Then came the sprays of berries. I loved seeing the berries on the mantle so this translated well to the tree too. I take the sprays and bend each long support stem into a half moon shape before sticking it into the tree. That gentle curve makes them look so real. My best tip at this point is to turn the lights off on the tree so that you can see where you are alternating the pops of red. Then came the some champagne colored berries….this time the sprays were big bundles that I had to clip apart. This meant that I had six stems for each bundle! Same with the white peony flower bundles. I simply clipped those apart with wire clippers. All of those picks then were stuck into the tree at random. Time for the topper! I made three big bows of ribbon and used a bit of twine to make a tie for the back. The star was a wall decor item but it was so sweet that I knew it would be PERFECT as our tree topper. My kids love the christmas star….they think it’s very important…so I didn’t want a small one (even a normal sized star looks itty bitty on a big ten footer of a tree!). This one was very big and it matched the houses on the mantle so it was a great fit. I hot glued some ribbon on the back to make it really easy to attach. Once the ribbon was up and the star securely fastened, I used some additional sprays to decorate the top to make it look more glorious. Then came time for the ornaments. Remember the birdhouses that I picked up at JOANN? These were so beautiful that I could have left them plain….how cute would that look on a midcentury modern type tree! SO adorable! But for our situation I decided to whip out the craft paint and go at it! Now they look like this…. Max was able to be such a big helper – he got most of the red on his house instead of his clothing so that is a huge win! I popped those on the tree after they dried and they were the perfect size! They perfectly complimented the little galvanized metal luminary houses that were from JOANN….can you spot them? They are aluminum and red colored! With such a tall tree, it’s important to vary the sizes of ornaments and the houses were big enough to make a statement without looking out of place. I also turned a string of bell garland into individual ornaments. And I love how the tree ties into the mantle….totally like a curated look that screams Christmas! And speaking of varied sizes of ornaments….I found some of the vintage ornaments that my mom handed down to me from when I was really little and we dug out all the little ‘house’ themed ones. Max LOVED the tiny little ones and since they are wooden, they aren’t breakable. It helps that they don’t look like a baseball either….no temptation! And here is the view from below. I always loved laying under the tree and looking up at it so this vantage point is so welcomed to me! So that is our Christmas tree….one filled with flowers and berries and homes and ribbon and memories! I love that we did a tree without the balls for once and proved that you can fill up a big tree and still get that traditional look. So that leads me to my next question – do you guys do themed trees? Or maybe you do a memory ornament tree? Or a separate tree for the kids? Or maybe you fill yours to the brim with balls? Or maybe its simple with just lots of lights? I’d love to hear all about it! I’d also love to hear what your FAVORITE ornament is….maybe something old or new or just special to you? Hi Katie, do you mind sharing where you got your christmas tree from? We are looking to get a plastic one next year and hoping they go on sale post christmas. My 2.5 year old son would have totally chomped down on that donut ornament too! In fact, we had to hide the ornaments that looked like Hershey kisses on our tree. Gotta love this stage. I REALLY love this tree! 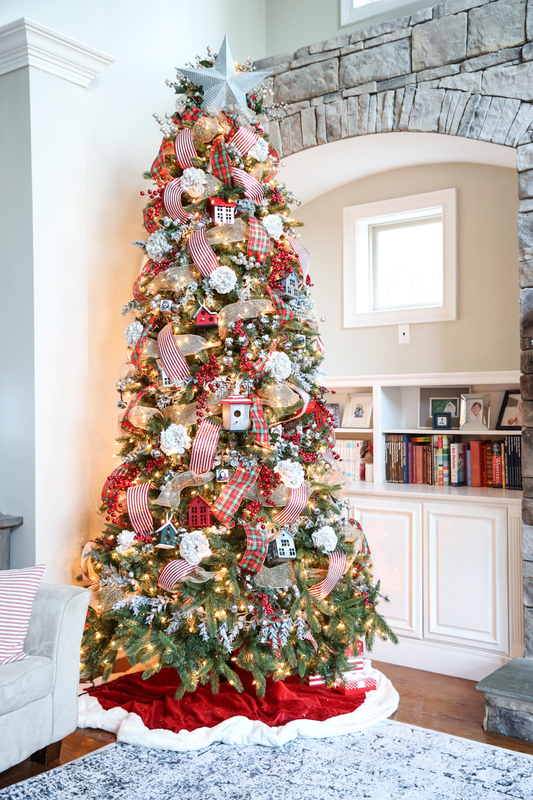 I love what you did with the ribbon and wouldn’t have thought to add garland to a tree as well! Great ideas! The tree is beautiful but how do you justify buying so much STUFF that seems to only be used once? We are certainly working with different budgets but it seems like you have been doing an obscene amount of shopping lately and most of it is for stuff that you already have and is just adding to your endless piles of stuff. It’s becoming super cringy and unrelatable. I think you used to be very involved in your church/community so would love to see some more posts about how you give back and not just how you keep filling your house with unnecessary stuff. Your tree is gorgeous! I need to try ribbon! Each year, I pick out an ornament that represents something our children have loved that year. So this year, we got a Minecraft ornament, a baby Chihuahua dog ornament and a tiny hammer ornament. All of us love going through the ornaments and finding the name and year on the bottom to see who loved what when. Every year my Grandmother gives us each an ornament that represents us for that year. Like I got a car when I first started driving, etc. This year my gma was just placed in hospice so decorating the tree and looking back at all the ornaments she gave me is so bittersweet. We always do our tree up with all of the ornaments and 90% are special ones. I love having my son’s first Christmas ornament up in front since it’s his second Christmas this year. We also go to the forest and cut down real ones and make a day of it. So many good memories around Christmastime. Sending you so much love and prayers for your first Christmas without your grandma. It’s so hard. This tree is gorgeous! I appreciate the step-by-step to see how easy it can be. I would love to do a theme tree but my husband is very old-school and thinks it’s too fussy, and we only have room for one tree. Someday I’ll do one! Thanks for the inspiration! I am a little wack-a-do about Christmas Trees. We have 5. The main one in the living room has white lights, gold mesh ribbon, and all our collected ornaments. Ones that I have had since I was a child, ones my husband has had, and all the ones since we got married and have had three kids that are now teens! I. LOVE. THIS. TREE. I also have a tall and super slim tree in our formal dining room. Which is also the informal dining room since we don’t have an eat in kitchen. Its a fairly formal space, but well used (all meals, homework, crafts…everything). This tree is gold, copper, silver, sparkly, and full of ribbon, coordinating ornaments, and white lights. The third tree is in our master bedroom. Its just covered in white lights with a simple faux fur white tree skirt. The 4th tree is on the third floor of our house which is where all the kids bedrooms are. Its a lime green and red themed tree with a lego village underneath, and lots of lego ornaments and whimsical picks and ribbons. Its just a fun tree! The last tree (yes…I know I have a problem) Is in my daughters room. We flocked it ourselves, and made a gold and pink themed tree. If I were a better photographer, it would be pinterest worthy (and most of the times on the tree came from the dollar store!!) It is truly beautiful. I love my trees. So much… I am still working on my husband to let me have 2 more! I have just the places for them……..
It’s absolutely beautiful, Katie! And you make it look so easy. Love your explaining of exactly how you did it, too, and with your little “helpers”. 🙂 One question that you have probably answered in years past but I don’t remember is: how do you tether your tree so it won’t fall down? (We use fishing line behind it tied to the wall/moulding but with wondered how you do it with such a tall tree?) Thanks, and Merry Christmas! Dude … you are a genius – the peonies, the berries, gluing ribbon to the back of the star to make it a topper. Excuse me, I must go redecorate my tree now! Love the tree! I just have a few questions how many of the sprays did you buy and the poinsettia’s? Your tree looks so beautiful! This is probably a dumb question but do you have a video tutorial on how you do the tree ribbon(s),? I am clueless about how to begin and where to tuck under and how it all works. The flowers are peonies I believe and I got two sprays with six flowers each. Sorry you feel this way! We do donate a lot of stuff back to our favorite charity (it’s a local one that is 100% volunteer based and feeds kids in our area) so that’s how we justify new purchases….we just don’t advertise that. And I get it…we shop more than the average person because it’s tax deductible if we talk about it online…this is a business after all…and I would rather spend it on things I love than just pay it in taxes later….Does that make sense? I know that not everyone is a blogger but this is how it works! Je ne comprends pas toujours toutes les explications en anglais, mais j’aime les photos de votre jolie décoration. Et quelle charmante famille ! Just WOW! Christmas tree goals! I love the “home for the holidays” theme and how you wove all the cute houses through your designs. I never thought of using bird houses as ornaments! I’m shamelessly stealing this idea for next year! I look forward to seeing your Christmas decorations each year. This is another beauty! I love the theme, and the tiny house ornament is so very sweet. Happy holidays to you and your family! This is a seriously BEAUTIFUL tree, Katie! I love it! We went a little different this year too and I’m so happy my husband and I are finally creating some of our own traditions and things we love together. We’ve always collected an ornament from each place we travel to which gets us talking about each trip as we decorate and I love reliving those memories! We also put up a small tree in our bedroom too and that one is really special to me…it’s very simple filled with sprays and frosted pine cones, like your ideas, but the ornaments are a combination of crystal drops and champagne corks from each anniversary or special occasion through the years. I mark the date on each one and add a hook or ribbon for hanging. We also have a collection of white starfish made into ornaments from my sister’s wedding, so I sorta-call this our “wedding tree” and I adore it. Also, your tree and mantle are just beautiful! Merry Christmas! LOVE this tree and your info on how to achieve it. I went with a color scheme years ago and made most of my ornaments. I also have ones that people have given me which are placed in a prominent place. These are especially important since many of the people (like my Dad and good friend) have passed. It’s sweet to remember them as I place them on the tree. I also started making ornaments for my niece – each year I take a picture of her small kids and make a rustic-type ornament, dating the back. This year, for my nephew, whose wife is expecting, I took a picture of the sonogram and made an ornament, and I’ll continue the tradition next year. I just want to say that the critical comment was very unkind. She has a point, but it could have been made in a much kinder and more respectful way! Please don’t let that comment stick with you. And your tree is gorgeous–but not as gorgeous as your precious children! I also feel that you buy so much stuff. As a long time reader, I don’t mean to be snarky but do you struggle with the balance of being able to buy stuff as a tax write-off and teaching your children about selflessness and consumerism? We recently downsized, not because we had to but because of the lessons we have learned over time that are most valuable to us, which one of those lessons happens to be about how much stuff American’s accumulate. I have two toddlers and we are always talking to them about how we/they have to work hard and really think about what is the best way for them to spend their money. And it could just be that not buying all the toys and all the things is my focus right now in mine and my children’s lives but I only wanted to comment because it feels like the blog is getting less and less relatable. As a fellow christian who views you as an online friend (the way blogs make you feel), I feel like the buying all the stuff is not what Christianity teaches us. I know you mention you give stuff to a local charity but a lot of people who don’t buy as much also does. I will still read this blog and don’t mean for this comment to come across as mean but as constructive feedback from a longtime reader who loves your blog. Aww thank you Melissa! I guess I just love this time of year – it’s hard to get mad! I’m sorry you feel that way Jenna! I really do. It’s a hard balance…and one that becomes tricky especially for those of us that gift-giving is our love language. If you want to chat more, feel free to email me. Love the tree! I never would have considered adding garland or removing sections, but it’s so smart! I checked the comments and I can’t believe no one asked where your grey sweater is from! I love/need it! Simply beautiful! I always thought a kid proof tree meant felt and brightly colored homemade ornaments… this is functional for the littles and gorgeous! Love! Merry Christmas, thank you for your blog and enjoy your family. The tree is gorgeous! Sooooo…. typically I do not leave comments & I also do not usually read them, but my reader somehow jumped to the comment section before I could read the post and I saw this one (Feedly) I was a bit behind and caught up on NY weekend and this comment has bothered me for over a week!! First, Jenna, the post begins with the disclaimer that this is sponsored by JoAnn’s, you will understand that if you took a minute to think about it…. Second, this is a business, nuff said. There are quite a few things about your comments that bother me but probably the one that leads me back is this one! “I feel like the buying all the stuff is not what Christianity teaches us.” Lady please check yourself & your judgey ways! I know of no teaching that backs up your opinion and perhaps you should rethink and pray about your jealousy. Katie, I appreciate the inexpensive way this tree was decorated, it serves as an inspiration to change things up. I did something similar this year with ribbon & picks adding some already owned ornaments which fit the look I was going for… I enjoy your Blog, even though I am sometimes reading a backlog at once. I enjoy seeing your family grow as well, God Bless them 🙂 OK I feel better now…… sorry it was so long after the date of your post. Jenna I am praying for you girl!